The innovative company RoboLabs manufactures wide range of high-tech products for popcorn manufacturers, cinema chains and HORECA. Robolabs’ equipment is sold and distributed in more than 20 countries. "We have tried a new batch of corn and the Robopop performed very well. Thank you. and it appears you have 2 additional products that are now of interest to us." with your product development and also the quality. Our Electrician say that Kabel work is perfect." Ventilation Water filter- trapper of the finest particles, generated in open fire cooking processes ( charcoal) , made of stainless steel and designed for trapping and clean-up of the finest grease, soot and smoke particles. 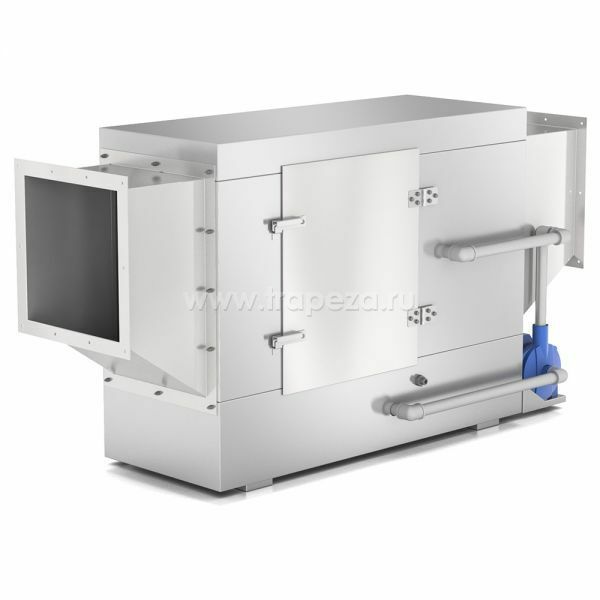 It is also designed for sharp dropping of the temperature of the generated air flow. 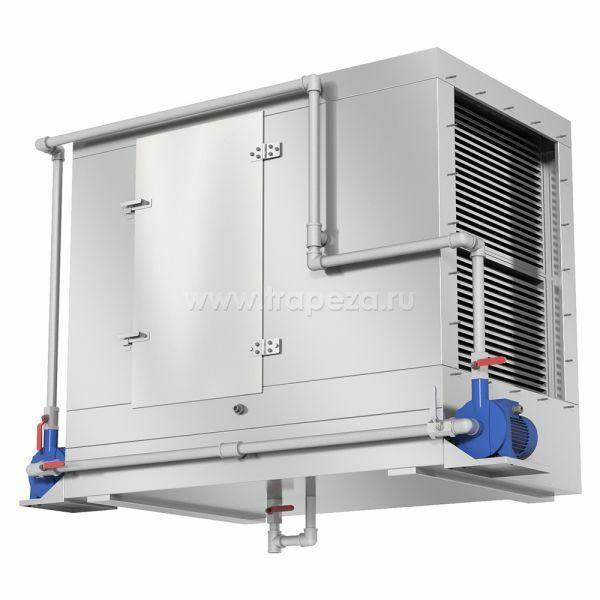 The water filter is incorporated into the ventilation system with the air duct dimensions of 250х250mm. The water filter is designed for the capacity of 1000-1500m3/h. Air clean-up consists of three stages: 1) mechanical labyrinth filtering; 2) shower filtering; 3) mechanical labyrinth filtering. The water filter is equipped with a centrifugal pump with 0,25kW capacity. The case has a hatch for maintenance, clean-up and installation of labyrinth filters. The hatch is on the right in the direction of the air flow. Ventilation Water filter- trapper of the finest particles, generated in open fire cooking processes ( charcoal) , made of stainless steel and designed for trapping and clean-up of the finest grease, soot and smoke particles. It is also designed for sharp dropping of the temperature of the generated air flow. 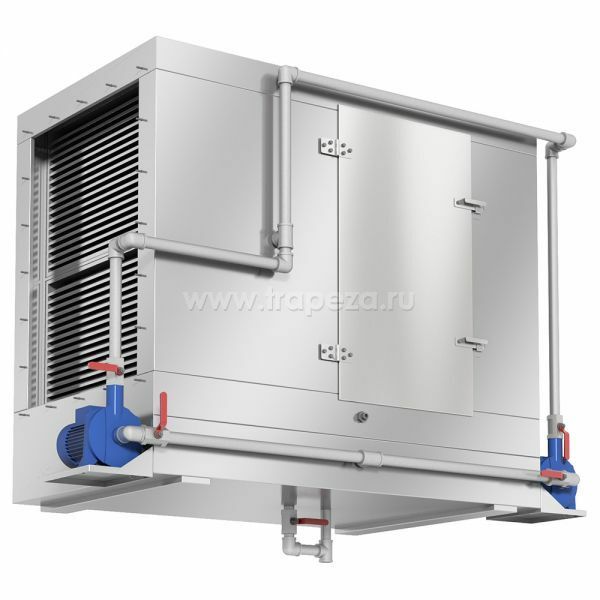 The water filter is incorporated into the ventilation system with the air duct dimensions of 250х250mm. The water filter is designed for the capacity of 1000-1500m3/h. 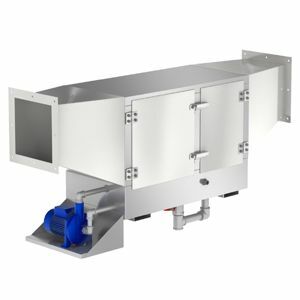 Air clean-up consists of three stages: 1) mechanical labyrinth filtering; 2) shower filtering; 3) mechanical labyrinth filtering. The water filter is equipped with a centrifugal pump with 0,25kW capacity. The case has a hatch for maintenance, clean-up and installation of labyrinth filters. The hatch is on the left in the direction of the air flow. Ventilation Water filter- trapper of the finest particles, generated in open fire cooking processes ( charcoal) , made of stainless steel and designed for trapping and clean-up of the finest grease, soot and smoke particles. 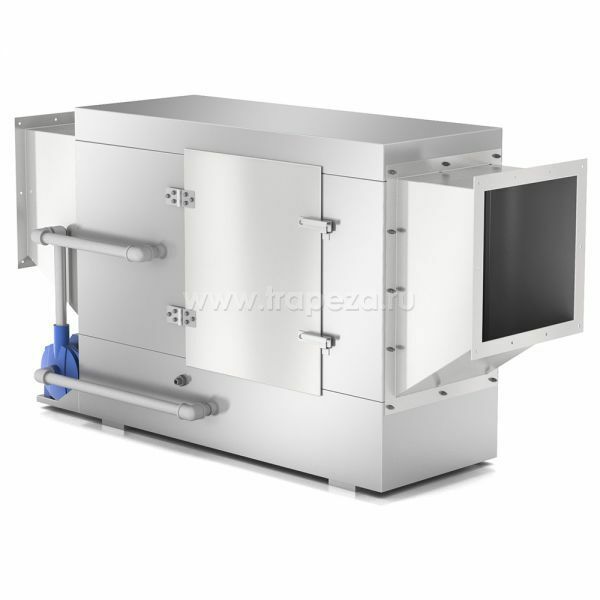 It is also designed for sharp dropping of the temperature of the generated air flow. It is also designed for sharp drop of the passing air flow temperature. The filter represents a case with the 1250х500х900mm dimensions, made of stainless steel. The air duct cross section is 400x400 mm. The water filter is designed for the capacity of 2500-4000m3/h. Air clean-up consists of three stages: 1) mechanical labyrinth filtering; 2) shower filtering; 3) mechanical labyrinth filtering. The water filter is equipped with a centrifugal pump with 0,75kW capacity. The case has a hatch for mainfance, clean-up and installation of labyrinth filters. The hatch is on the right facing the direction of the air flow. Completed with two conjunctive air ducts with exit section of 400х400mm. Ventilation Water filter- trapper of the finest particles, generated in open fire cooking processes ( charcoal) , made of stainless steel and designed for trapping and clean-up of the finest grease, soot and smoke particles. It is also designed for sharp dropping of the temperature of the generated air flow. It is also designed for sharp drop of the passing air flow temperature. The filter represents a case with the 1250х500х900mm dimensions, made of stainless steel. The air duct cross section is 400x400 mm. The water filter is designed for the capacity of 2500-4000m3/h. Air clean-up consists of three stages: 1) mechanical labyrinth filtering; 2) shower filtering; 3) mechanical labyrinth filtering. The water filter is equipped with a centrifugal pump with 0,75kW capacity. The case has a hatch for maintenance, clean-up and installation of labyrinth filters. The hatch is on the left facing the direction of the air flow. Completed with two conjunctive air ducts with exit section of 400х400mm. Ventilation Water filter- trapper of the finest particles, generated in open fire cooking processes ( charcoal) , made of stainless steel and designed for trapping and clean-up of the finest grease, soot and smoke particles. 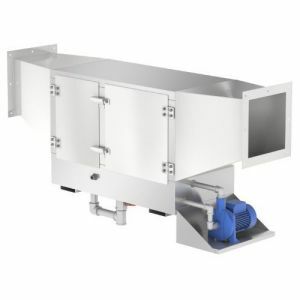 It is also designed for sharp dropping of the temperature of the generated air flow. . The filter represents a case with the 1500х900х1300 mm dimensions, made of stainless steel. The water filter is designed for the capacity of 4000-7000 m3/h. Air clean-up process consists of three stages: 1) mechanical labyrinth filtering; 2) shower filtering; 3) mechanical labyrinth filtering. The water filter is equipped with a centrifugal pump. The hatch for the filter maintenance is on the right facing the air flow. Dimensions of input and output sections: 700х900mm. At its installation it is recommended to use B02-50/50 adaptors, code 65307, both for inlet and outlet. Completed with an additional backup pump for quick connection to the hydrofilter in case of main pump's malfunction. Ventilation Water filter- trapper of the finest particles, generated in open fire cooking processes ( charcoal) , made of stainless steel and designed for trapping and clean-up of the finest grease, soot and smoke particles. It is also designed for sharp dropping of the temperature of the generated air flow. The filter represents a case with the 1500х900х1300 mm dimensions, made of stainless steel. The water filter is designed for the capacity of 4000-7000 m3/h. Air clean-up process consists of three stages: 1) mechanical labyrinth filtering; 2) shower filtering; 3) mechanical labyrinth filtering. The water filter is equipped with a centrifugal pump. The hatch for the filter maintenance is on the left facing the air flow. Dimensions of input and output sections: 700х900mm. At its installation it is recommended to use B02-50/50 adaptors, code 65307, both for inlet and outlet. Completed with an additional backup pump for quick connection to the hydrofilter in case of main pump's malfunction.